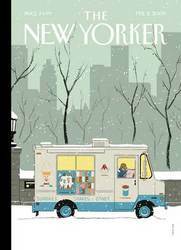 Tomine’s delicate linework and subtle coloring lend themselves well to the inherent incongruousness of selling ice-cream on a wintry day. It isn’t a clichéd form of comedy with a sad-sack salesman staring and shivering gloomily into the darkness. Tomine’s salesman waits for business, but not impatiently so. He’s snug in his earflap hat, scarf, and jacket. Besides the inherent incongruousness of this scene, there is also the innate optimism of such a commercial enterprise. If people, perhaps motivated by hunger or by childhood nostalgia, want ice-cream, they’ll buy ice-cream. But they’ll have to brave the snow to get it. When my grandmother, a native of much warmer climes, visited Hornsea, England in 1979, it was in the middle of a hard Yorkshire winter. The town was battered by bone-chilling North Sea winds. It didn’t matter. My father bought her a 99 Flake ice-cream crowned with two half-size Cadbury chocolate bars. It was so good that she felt she deserved punishment or time in a mental asylum. “They should beat me with sticks,” she said. It doesn’t matter if it is an odd thing to eat ice-cream in winter. Let’s all venture out into the snow and treat ourselves to a selection of sundaes, shakes, or cones. Happy times may be here again.